Mt. 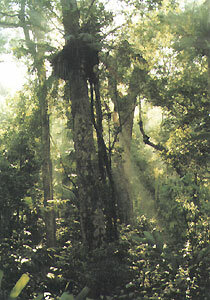 Jianfeng is situated in a subtropical primeval forest in Ledong County, Hainan Province. It has been set aside as a national forest park. The highest peak is 1,412 meters above sea level and the lowest is a mere 200 meters. The forest is a treasure house of plants and animals, with more than 2,000 species of vascular bundle plants, 300 kinds of trees, 148 kinds of birds and about 1,000 kinds of insects. Ancient trees produce green screens, vines form natural nets and rare plants blossom year round. In July of 1992, Mt. Jianfeng and the surrounding areas, totaling 1,739 square kilometers, were dcsignated as China's largest environment and development experimental zone, which is being developed into a comprehensive economic area with tourism as its main industry. A tourism route is to be opened to include scientific study, sightseeing, expedition and hunting. The route will reach Longxiu Crook, a cultural village of the Li ethnic group, a tropical tree park, tropical flower and fruit fair center, Sleeping Buddha, General Rock, Turtle and Tiger Fight, Deer Singing Valley, a world of musicians, Sacred Frog, Quiet Valley, natural reserves, Deer Tree, Fatty Pool, Tropical Rain Forest Expedition Zone, Natural Forest Bathing Ground and Penguin Welcoming Guests.